﻿ HuntingNut » Forums » Firearms, Shooting & Reloading » Reloading Ammunition » Where is your reloading room/equipment ???? Where is your reloading room/equipment ???? Posted: Sun Dec 02, 2007 7:59 pm Post subject: Re: Where is your reloading room/equipment ???? Useful items cannot by definition be junk....they are, as you rightly say, stuff...stuff awaiting use. Anything else belonging to another person, other than your buddies stuff that you are storing for them, in your spare room is junk. Posted: Mon Dec 03, 2007 1:10 am Post subject: Re: Where is your reloading room/equipment ???? Posted: Mon Dec 03, 2007 2:05 am Post subject: Re: Where is your reloading room/equipment ???? Powder, bullets, gun safe, cases and casting in the garage. Charging station, computers (with ballistic software), gun storage and shooting library in computer room (spare bedroom). Sizing and seating station in family room with TV. Works for me and wifey has a comparable amount of space for sewing and other junk. Posted: Mon Dec 03, 2007 8:12 am Post subject: Re: Where is your reloading room/equipment ???? Everything in one room except the tumbler and it's in the basement. Posted: Mon Dec 03, 2007 2:01 pm Post subject: Re: Where is your reloading room/equipment ???? Posted: Mon Dec 03, 2007 10:10 pm Post subject: Re: Where is your reloading room/equipment ???? All my stuff is in the garage. 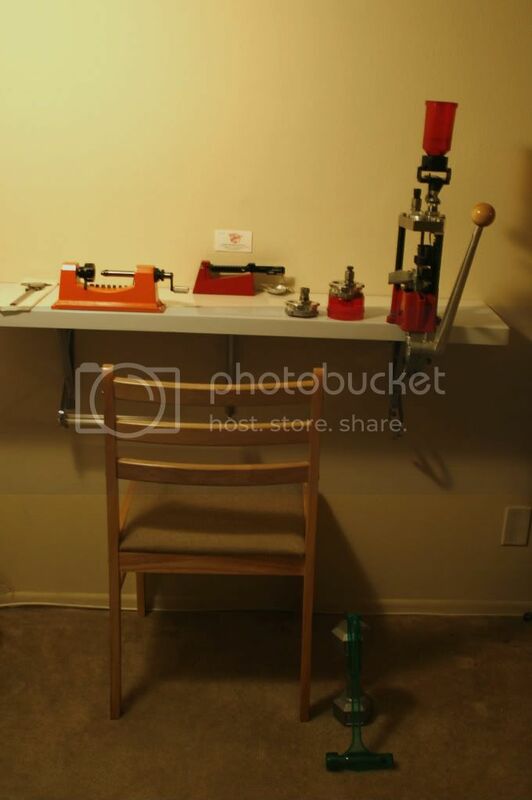 Have a reloading bench with anything and everything for reloading either on or under it, with the exception of powder...its in a safe beside the bench. My garage is my "dungeon". I regularly get chided for it being a bit of a mess, and for having to much crap and corruption in there....but its my area and I'm happy. Posted: Mon Dec 31, 2007 8:18 am Post subject: Re: Where is your reloading room/equipment ???? My garage is used for the cars and other tooling and machining work. There is no room in it for reloading gear. 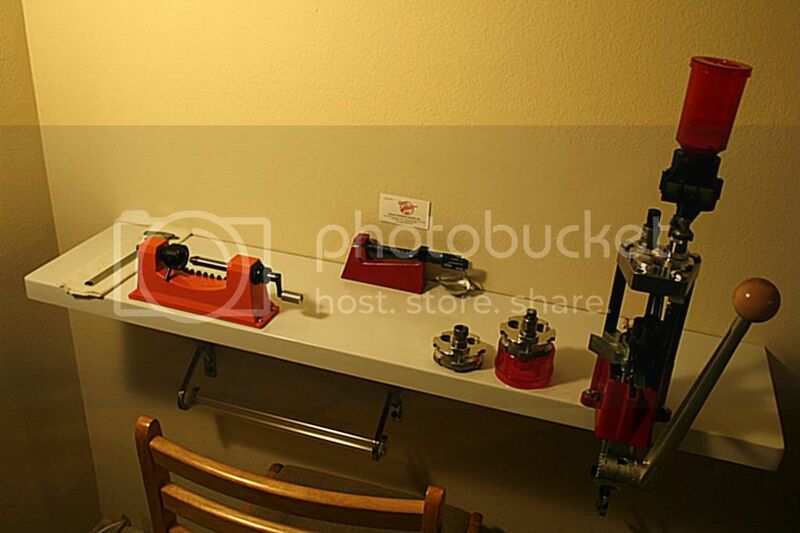 I have three small reloading stations in my basement. Cases, bullets and powder are stored next to it in cabinets made for the job. One station for rifles, one for pistols and one for shotguns. It is always warm and well lit. My wife doesn't complain because she has her own room for her sewing - complete with cutting table and two machines. Her room has better lighting but then she needs it. 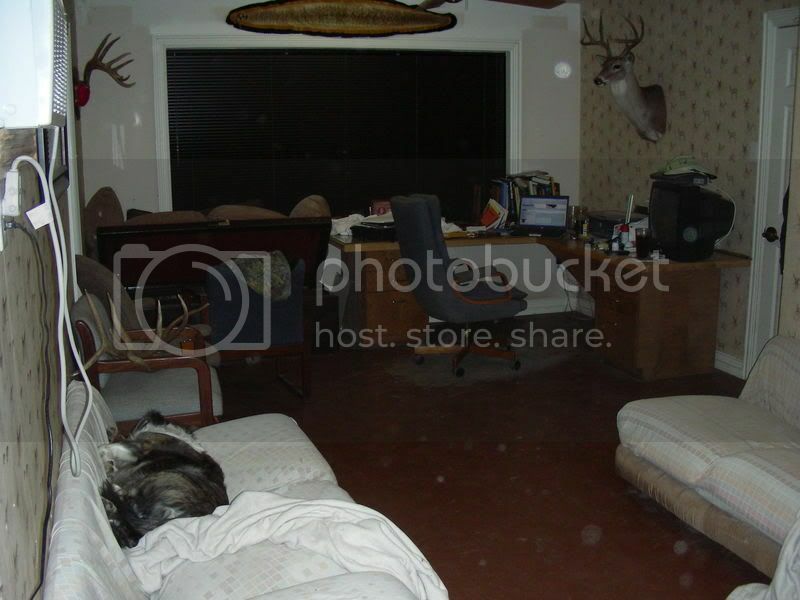 Posted: Tue Jan 01, 2008 12:06 am Post subject: Re: Where is your reloading room/equipment ???? Out of the house, across the breezeway, over a painted line on the concrete that says "by permission only", through a gate and through a lockable door that only I have the key to - into a 20x40 air conditioned and heated workroom (attached to my garage). Beer in the fridge, TV and DSL computer connection. The doghouse - paradise! "What my wife doesn't know doesn't hurt me"
Posted: Tue Jan 01, 2008 9:33 am Post subject: Re: Where is your reloading room/equipment ???? Once the last of my three kids moved out I commandeered the upstairs of our house in its entirety as a combination reloading/gun workshop/retreat. This way I have the security of having it where I can keep watch over things and not have to brave the weather to go to it. Unfortunately, even though my gun and working space is 15 X 30 feet and sports 20 feet of bench on one wall (reloading and cleaning) and a 12 foot bench on the opposite wall for gunsmithing tasks with the balance taken up by guns and accessories, it is still too small! It pretty much appears that my stuff hates to see an empty space and does all it can to fill it. 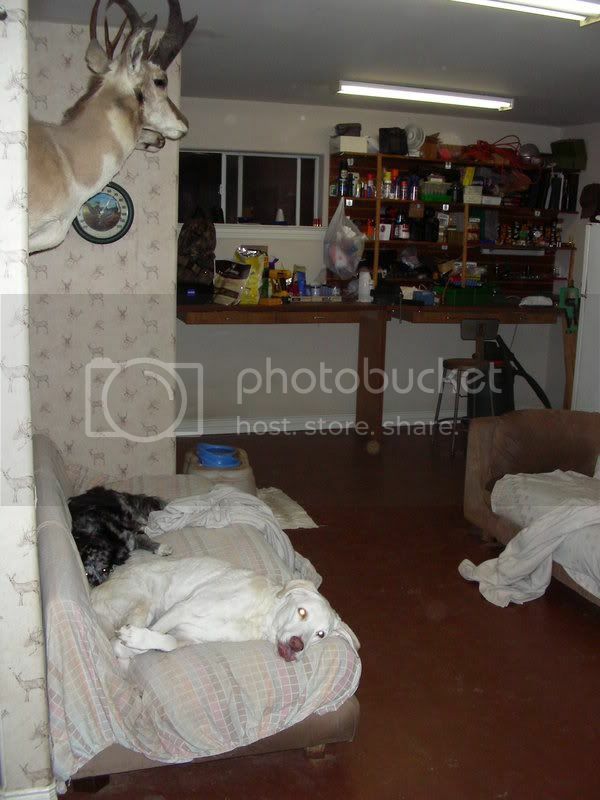 Posted: Tue Jan 01, 2008 12:21 pm Post subject: Re: Where is your reloading room/equipment ???? Posted: Wed Jan 02, 2008 6:50 am Post subject: Re: Where is your reloading room/equipment ???? Posted: Wed Jan 02, 2008 8:15 am Post subject: Re: Where is your reloading room/equipment ???? That's for the dogs. The sheets are to keep the low couches a little cleaner. That white Chesapeake sheds enough small white curly hair everyday to make a blanket. I do sleep in the main house. Posted: Wed Jan 02, 2008 12:07 pm Post subject: Re: Where is your reloading room/equipment ???? Woods-that's a great reloading room,but where is the bigscreen? I like the attitude of the dog near your signature!! Posted: Tue Jan 08, 2008 1:32 pm Post subject: Re: Where is your reloading room/equipment ???? I have posted here already, But here is a picture of my Home away from home. Has a little loft with carpeted floor, color TV, fridge with Budweiser, and a cot with electric blanket. The top was made from (2) sheets of 12”x 4’x 3/4” birch ply, screwed and glued together. Then it was banded with poplar strips mitered at 45* then glued on with biscuits. Rounded all the corners and edges and sprayed it white with a rattle-can. A friend made it for me after I gave him my plans. I know diddly about wood, I'm better with wrenches than saws. The brackets were the biggest I could find at the local Home Depot, 11”x 8”, then, I lagged it to the wall studs and this sucker is rock solid. When the next big earthquake hits, I’m getting under it. The press is a Lee Pro 1000. I got this press for a few reasons. Room mostly. I also got three turrets for it. I install the de-cap/size die on the first one then attach the feed tubes, send the brass through and punch out the primers and size in one stroke. The spent primers go into a can through a hole in the bench. The cases end up in a little container next to the Lyman trimmer then get trimmed and de-burred then dropped into the tumble that goes outside on the porch. This operation goes really smooth and cuts down on handling things over and over. After a quick tumble, primer pockets get picked and brushed. Then they get stored in a box, mouth down, till I’m ready to reload. When I’m ready to reload I install the primer tray, pop the next turret in (takes literally two seconds) with the flare/charge die/powder hopper, and, the seat die. I don’t use the crimp feature of the seat die as I do that operation separately. I do the cases one at a time, w/o the feed tubes, so I can have a good feel of what is happening and I’m really in no hurry anyways. Even doing only one case at a time things go pretty quick. The auto-prime has a good feel when the ram goes down and really does a nice job of seating the primers. The measure drops right at or a little under weights, maybe 3/10’s/gr max. It can’t drop over unless you double stroke the ram or there is a clog that finally dumps (keep it clean kiddies! ), which I doubt will happen as it really jerks/drops the hopper when lowering the ram knocking out the powder from the feed hole in the die- you can see into the case with the ram up, through the die- even with the disc projected. I’m actually surprised at the mess it does not make. Next I install the third turret with a crimp die, insert a round, raise the ram 1” to disengage the ratchet and manually advance the shell plate two stations then crimp. Slick as a whistle. I never plan on going full-progressive. I like taking my time and doing one round at a time. It took me some time to figure it all out and getting it running. I practiced on some old cases and some old bullets I had that I don’t plan on using (w/o powder and primer). I was really having issues getting a good roll-crimp on the bullet with the seat/crimp die. I ended up buckling a few cases as I progressed with the crimp, and, it would mush down and deform soft hollow points. I progressed it VERY slowly on the crimp, it would only get so much then buckle and mush the hollow point. The tipping point and balance between seat depth/crimp was too hard to find and feel. Regardless of case length. I spent an hour trying the seat/crimp operation, pull bullet, start over w/ another bullet. Just too much going on in one operation. I could get a good, very light crimp w/o mashing the hollow point, and, that’s it. Light crimp is fine for light target loads, not for hunting stuff with all that recoil, IMHO. So- since I had an extra seating die, and a third turret, I took the seating portion out of the extra die out and installed the naked die in the third turret and use it as a crimper only and now I can get a firm crimp w/o any issues. The turrets are 10$ and I’m getting more, and, other shell plates for other pistol calibers. I produced some nice looking rounds Saturday w/ some good, pre-prepped brass I had processed prior to getting it all set up. First loading was with an X-Treme .430” 200gr CP RNFP over 7.0gr of W-231 and a CCI 300 primer. I’ve yet to test them though. I’ve been doing a lot of reading on VMD, burn rate, reduced loads and pressures. I’ve also learned the stuff you load in winter will likely have more pressure in summer. So that’s something to think about too. I’m really paying attention to pressure and everything associated with it. I’m also approaching everything with caution and attention to detail. I actually look at pressure first after I select a bullet. High-pressure kills. I’m not trying anything fancy or off-base, and, not being blinded by just one factor of the recipe. Just sticking to basics for fun, safe, mild loads for target practice per pre-printed load data. I’ve already got plenty of hunting/full power (START, never MAX) loads already made up using pop’s equipment. Those get done literally one at a time on every operation. I have a box of tools and other bits I keep hidden elsewhere with the turrets so when someone comes over the only thing out is the press that’s covered and the trimmer that’s screwed down to the bench. The brackets also have some arms on them, I store the feeder tubes there and they are barely noticeable. It’s pretty sano and un-obtrusive and takes up very little room in a corner of my home. I also keep a small 10lb. dumbbell handy for my bullet puller. A few smacks on the end of the dumbbell and it yanks even heavily crimped stuff in a jiffy. Toss same behind the sofa and ya’d never know it’s there. It’s been a project and I’ve still got to get an ‘O’ press and other things for rifle stuff, but, that can wait for now so…the main thing is I am self sufficient for revolver stuff. And- learning something new. It’s fun to see the fruits of your labor, all shiny and new like. I’m starting to get a feel for it and it’s a lot of fun.